Company: Can be kept in most community aquariums. Don’t keep with large aggressive fish. 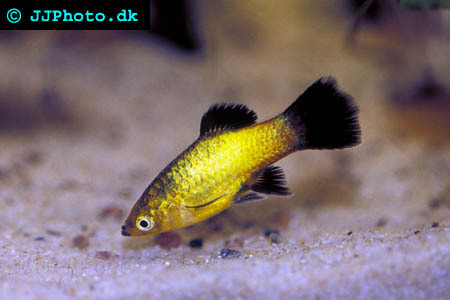 Aquarium setup: Platy should be kept in schools in aquariums decorated with dense vegatation and open areas to swim in. Avoid decorations that lowers the pH level in the tank such as bogwood. Feeding: Eats anything small enough to fit into their small mouths. Breeding livebearer. Males slimmer. Livebearers can always be sexed by the fact that males got gonopodiums and females doesn't. 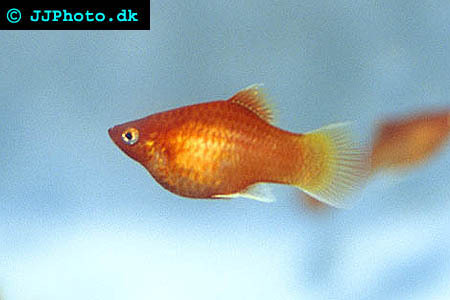 Female platys give birth once every 4-6 weeks. Each broad contains up to 70 fry. The fry is large and accepts small flake food. Fry grows fast.